This is another one of those instances where I’ve judged a show by its English title. Not too recently, I reviewed Girls Beyond the Wasteland, and I was expecting something post-apocalyptic and dystopian, a female Mad Max anime. You can imagine my surprise when it turned out to be anything but. And then School Live! turned up for review. Having reviewed two seasons of Love Live not too long ago, and knowing full well the anime industry’s penchant for jumping aboard the bandwagon once shows become hits, I was fully expecting another 13 episodes of high school, pop idol glee, accompanied by dodgy CGI song and dance numbers. Yeah, not a lot of glee in this one, although it might just be one of those anime that turn out to be the high point of the year. Yuki Takeya loves school. It’s the best place in the world. She loves the students, she loves the teachers, she loves the lessons, and most of all she loves her after school club, the School Living Club. It’s where she has the most fun with her friends, Yuri “Rii-chan” Wakasa, Kurumi Ebisuzawa, Miki “Mii-chan” Naoki, their club adviser Megumi “Megu-nee” Sakura, and their pet dog Taromaru. It’s the perfect escape from the real world, where they can enjoy all manner of extra-curricular activities. Yuki needs an escape from the real world; she can’t accept the real world, not the real world of the zombie apocalypse! 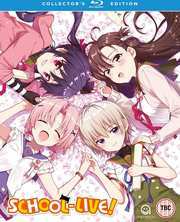 The twelve episodes of School Live are presented across 2 Blu-ray discs from Animatsu as follows. 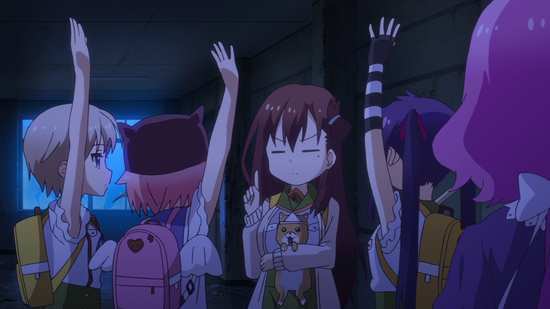 School Live’s 1.78:1 widescreen 1080p transfer is up to the usual standard of modern anime on Blu-ray. It’s clear and sharp throughout, with strong consistent colours, and no particular issue with compression artefacts or digital banding. The incongruity of the genre clash is reflected in the animation, with cute, appealing character designs for the main cast, while the post apocalyptic world has a chilling darkness to it. 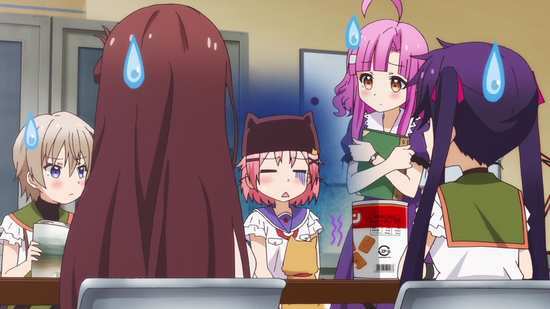 It’s hard to take cute character designs and make them horrific without making them comedic as well, so School Live has a conceit where there is a swirling dark miasma practically concealing the antagonists, and this maintains the correct dramatic tone through the episodes. 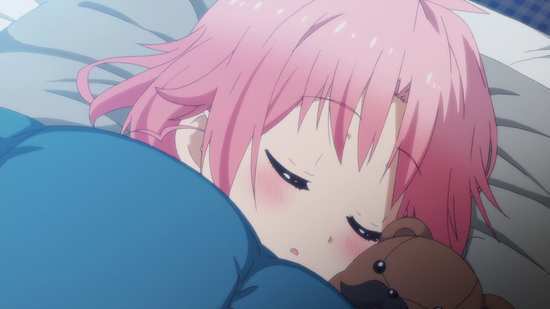 School Live offers the choice between DTS-HD MA 2.0 Stereo English and Japanese, with subtitles and signs locked to the appropriate track. I was happy with the original language track, and quickly grew to appreciate the inaptness of the clichéd cutesy character voices in an unlikely situation. That difference is somewhat lost in the English dub, at least what little I sampled of it, which opts to play the drama straight. The dialogue is clear throughout, the subtitles timed accurately and free of typos, and the stereo does enough to bring across the action and the show’s music. The discs present their content with static menus. Each episode is followed by a translated English credit reel. All of the extras are on disc 2 and comprise 6 textless openings, 8 textless closings, and trailers for RE-KAN!, Punch Line, Rozen Maiden Season 3, and Softenni! This is a collector’s edition combo release, but I haven’t seen the packaging or the DVD discs to comment. Combining ‘cute girls doing cute things’ with post apocalyptic horror begets a whole new genre. Let’s call it, ‘Slice of Death’. Of course the whole thing is a spoiler, really. It’s impossible to talk about this show, even read the blurb on the back of the case without spoiling its biggest surprise at the end of the first episode. After all, it starts off like any high school, slice of life show, an after school club featuring four girls and their teacher/club adviser, very K-On! in tone. They even have a mascot, a pet dog rather than a pet turtle. And by the end of the first episode, they’re trapped inside the school, having barricaded themselves in, all to keep safe in a world of zombies. 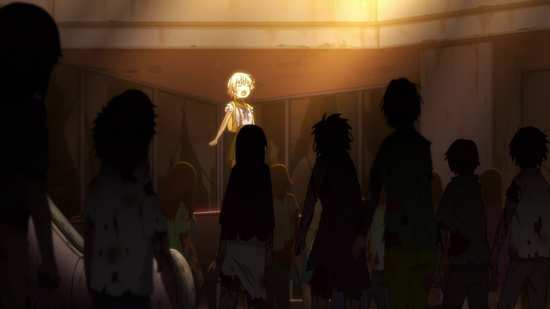 The really cool way in which this happens is the big spoiler, and it all centres on the main character, Yuki Takeya. The thing is that it’s the heart of the story, the driving force of the narrative. So I can tell you what it is, and you’ll understand just why this show is so cool, the story so gripping, why it is one of the best shows that you’ll probably see this year, but that really means spoiling it. Or I can avoid the spoiler, and School Live! will come off as just another survival horror show albeit with a cutesy twist, where it is actually so much more than that. I’m just going to keep schtum, and hope that you can trust my oblique hyperbole as sufficient recommendation. It’s odd really. I have no particular affinity to horror, and my least favourite sub-genre is the zombie movie. 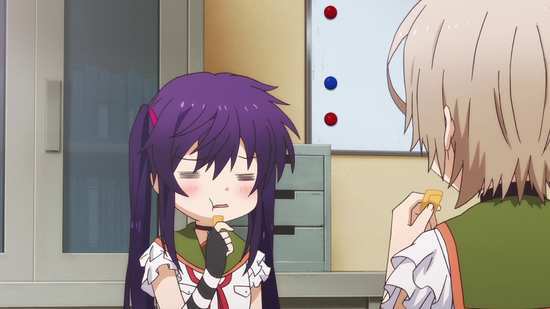 But I now have two anime that I adore that feature the undead, the fan service laden High School of the Dead, and now this School Live! This is less fan service than it is slice of unlife, as it follows four girls trying to live an ordinary life in extraordinary circumstances. While the dead have arisen outside, all of their teachers and fellow students have fallen victim to the zombie plague, they’re trying to retain a semblance of normality in their self-created haven in school. So as well as going through the essentials of survival, they make time for school activities, lessons, their after school club, field trips, sports days, preparing for graduation and so on. It’s all presented with the cute playfulness of any such show, but you can’t get away from the dread undertone of their circumstances, which tends to make any humour somewhat edgy. 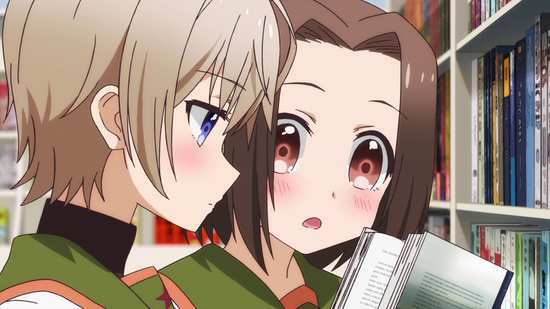 It’s an atypical slice-of-life show in that there is a strong narrative, instead of the usual vignettes of exaggerated cuteness. Part of it is told in flashback, revealing something of how this dire situation came about, part of it is in present time, asking the question as to just how and why this school is a safe haven from the zombies, why it so conveniently has solar power, water purification, and a food garden on the roof. The narrative moves forward to the point of the girls’ ‘graduation’ from school. 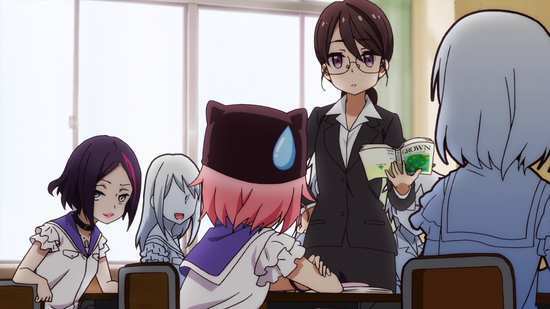 It’s a strong conclusion to the story, satisfying and well-earned, but the show sets up enough in the way of unresolved questions, and potential future storylines for a second season to be worth looking forward to, although just like High School of the Dead, a second season is yet to be green-lit. For once, the real spoilers come in the form of the characters, and their narratives, not in terms of the story overall, which is why talking about the story is safe enough. You can tell that I haven’t gone into the characters or their specific arcs in this review, and that’s with good reason. It also means that you’re going to have to trust me when I say just how good this show is, as it all boils down to the characterisations. 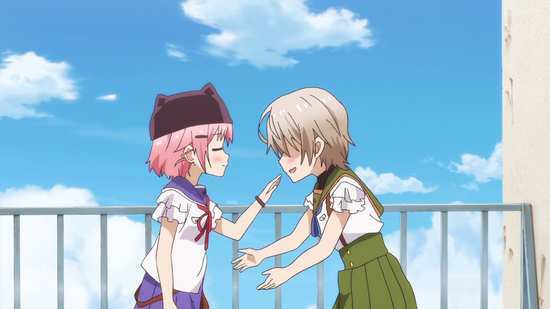 School Live is as entertaining as it is dramatic, and it runs the gamut of emotions. 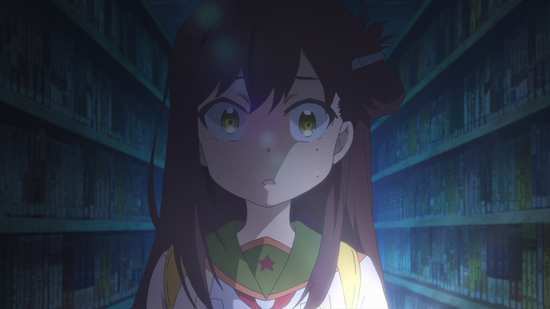 More impressively is that it’s an anime show, about cute girls and zombies, with an important message about grief, loss, and dealing with emotions instead of running from them. Don’t miss out on this one!